In the lead up to New Zealand Babywearing Week (10 – 16 October 2011) we will be focusing on the six main types of baby carriers – starting this week with the pouch sling. Keep an eye on the New Zealand Babywearing Week Facebook page too this week for more information about pouch slings including how to videos and photos. 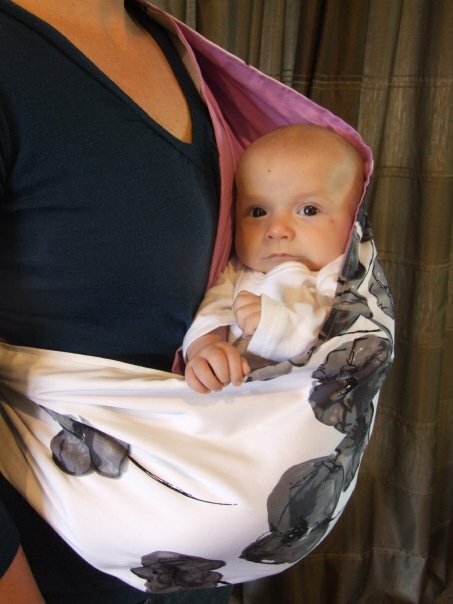 Pouch slings are a one shouldered carrier suitable for newborns through to toddlers. One of the most important things when purchasing a pouch sling is that it is the correct size for the wearer. Always refer to the size guidelines on the sellers website and measure yourself from the top of your shoulder to the opposite hip bone to determine the correct pouch sling size for you. If your pouch sling is too small it will be very tricky to get your baby into it. 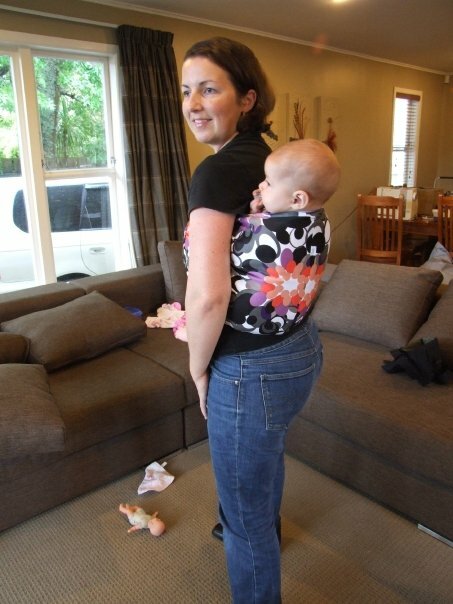 If it’s too big you will not be able to carry your baby snugly against your body, they will hang down too low and you will find that you need to have your arm around your baby to keep them secure which takes away the ‘hands free liberation’ possible with a properly fitting pouch sling. The image above shows an upright cradle hold which mimics how you would carry your young baby in your arms. Always check to make sure that your baby’s airway is clear – you can do this by making sure that you can fit two fingers under baby’s chin. If their chin is pressed into their chest their airway will be obstructed – you will need to adjust the positioning of your child in your pouch sling to allow the chin to come up off the chest. Also make sure that there is no fabric covering your baby’s face. You will see in the image above (tummy to tummy hold) that baby’s knees are higher than their bum. This ensures optimal positioning of baby’s developing hips and spine. For all holds where baby’s legs are outside the carrier ensure that the fabric of the carrier goes right to the back of the baby’s knees – this creates a comfortable seat for your child and automatically puts baby into optimal positioning with knees up and bum down. 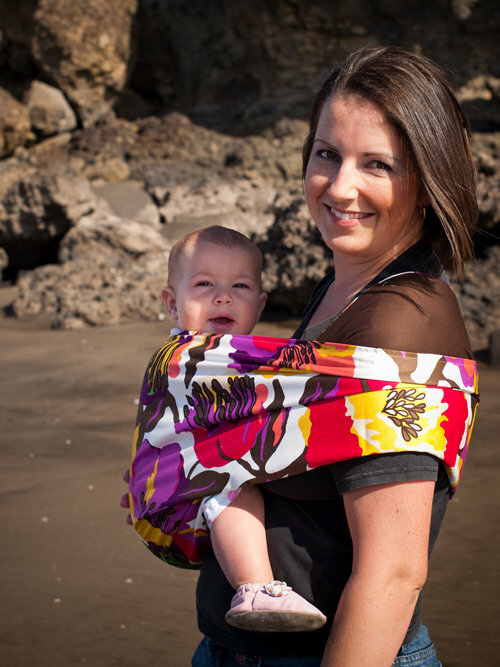 For more detailed information about pouch slings and to find instructions complete with photos, please visit Slingbabies! Thank you to Unido for permission to use their photos in this post. Remember to check out the New Zealand Babywearing Week facebook page this week for more information about pouch slings too. Article written by Helen MacMillan of My Natural Baby Ltd. This entry was posted in Pouch Slings and tagged New Zealand Babywearing Week, NZ Babywearing Week, pouch slings, slingbabies, unido. Bookmark the permalink.